We are a well known name engaged in manufacturing and supplying high performance oriented rubber testing equipment. Our equipments deliver outstanding performance and are offered at economical prices too. The range being easy in use and demands minimum maintenance. 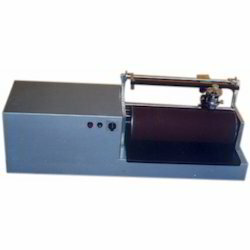 Our offerings include rubber hardness tester, IRHD hardness tester etc. We are offering a wide range of Rotary Drum Abrasion Tester which provides this high quality combination Rotary Drum Abrasion Tester for evaluating resistance to abrasion of rubber materials through the measure of volumetric loss of a specimen exposed to the action of a normalized abrasive medium secured to a rotating cylinder. When you want to determine the tenacity of rubber or plastic IRHD Hardness Tester deploys the perfect process. It has a predetermined indenter that is either conical pr spherical in shape. The indenter is applied on the rubber sample for a predefined period of time. The resultant indention is converted by dial gauge into hardness value.